We are coming to that time of year when many of us slow down for the summer. If you’re a student, or if you have kids at home, the days seem much different now. Lots of us go on vacation for part of the summer. The pace of life changes. I want to encourage you to do two things over the summer. First, when you travel, visit a local church. These can be wonderful opportunities to receive hospitality and to worship in ways that will be both familiar and strange. Maybe you’ll get some good ideas to take back to your home church. You’ll certainly be nourished by the riches of God’s word and sacraments. The Episcopal Asset Map is a great tool to help find a church while you’re out of town. Second, keep praying over the summer. God doesn’t take a vacation from us, so let’s not take a vacation from God. Use the Daily Devotions from Families and Individuals (found in the Book of Common Prayer starting at page 137). There are prayers for morning, noon, evening, and night. At just one page, these are brief prayers that are still filled with depth and beauty. Another way to nurture a habit of daily prayer in families is to pray at meal time. There are very brief prayers in the Book of Common Prayer at page 835, if you want short prayers that you can memorize. 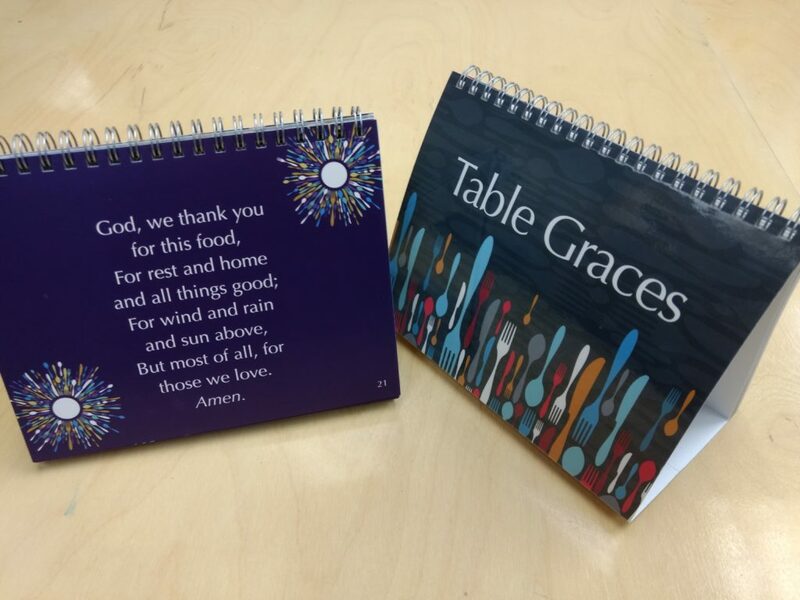 Or you can get copies of Table Graces and Family Graces from Forward Movement. These are table tents, easy to pray whether there are one, two, or ten of you at the table. Keeping up with our daily prayers helps us in our daily walk as followers of Jesus. Enjoy your summer, and enjoy praying all summer long. Today’s featured sale items are Table Graces and Family Graces.